In many transaction and inquiry windows, there are options for selecting whether the view will be the “Functional” currency or the “Originating” currency. Functional = the primary currency for the company database and accounting records, i.e. your base currency. In my example, using Fabrikam Ltd., the functional currency is US Dollars. Originating = the currency of the transaction itself. The originating currency can be the same as the functional, or another currency entirely if multicurrency is enabled. For the sake of this post, I will ignore the “Reporting” rate. I haven’t seen that used in practice myself, so I won’t confuse the post with that detail. In my opinion, for most data entry users, the correct selection is to have it on Originating. My rationale is when you are entering a transaction in another currency, it’s typically because you have an invoice or a quote or something in your hand with the currency units referenced in that currency (dollars, pounds, yen, etc.). It is far simpler for the users to enter the transaction in that currency directly, right from that source document. If your exchange rates are set up to default in an exchange rate, the user doesn’t need to know what the exchange rate is nor what the functional currency amount is, as that is pure math that the system will calculate. In my example, I have entered a Purchase Order (PO) in Canadian Dollars. However, my default settings are to view currency information in the Functional Currency. That is the default for new users in Dynamics GP. I am recording the PO from a quote from my vendor, which was $72 CAD per unit. It looks great, right? Well, not so fast! A user cannot even tell from this screen if it’s right or wrong, as there is no visual cue here whatsoever that the entry is wrong (or right). I can see in the Currency ID field “Z-C$” (boy, I hate the default Fabrikam currencies! ), and naturally, assume what I am entering amounts is in that currency. That’s incorrect though, that is merely the currency ID of that transaction, not necessarily the displayed currency on the window. Here’s what this PO looks like when I change my view under View > Currency to Originating. Now you can see a minor difference: the Canadian dollar currency is set up to have a “symbol” of C$, not just a $. Visually, that is beneficial to be able to easily identify that this now is actually the CAD value. And in my case, it’s wrong, because it’s after the exchange rate was calculated from the $72 I entered in USD currency above. The reason this setting is important is it would reduce data entry errors. If the user doesn’t know this setting exists, they could be entering transactions incorrectly and not aware there is a better way. This setting is per user and per window. (It might also be per company but I haven’t confirmed that yet). 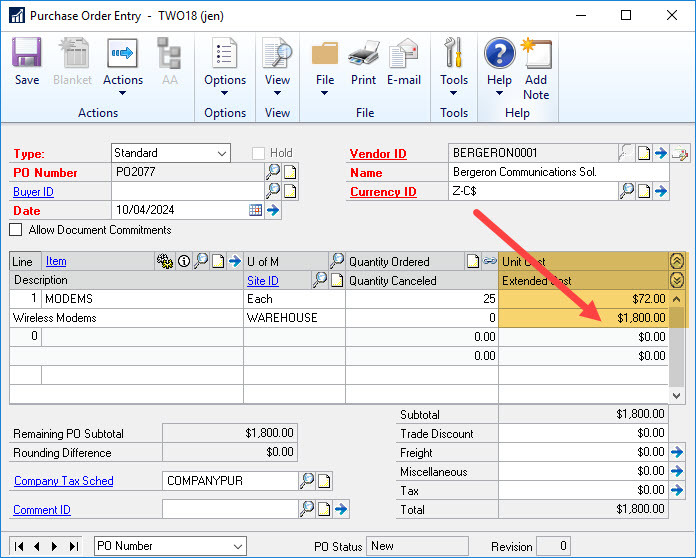 For example, I changed the setting in Purchase Order Entry, fixed my PO, saved it and closed the window. Then I went to the Transaction Entry window (i.e. Journal Entry) just to see if the setting rolled throughout Dynamics GP to other windows I use and the default view was still Functional. So, the best thing to do is show your users what this option is, where to find it and why Originating is likely the best choice for most situations, at least for data entry. The more users understand why this is useful, the better off they are in determining the correct setting for their day to day activities. For analysis and inquiry windows, the “correct” or best setting really depends on what type of analysis is being done. For transaction entry windows, I prefer to set to Originating so it will always display the proper amounts based on the transaction’s currency ID.